Sometimes all you need are your pajamas, a box and some crayons. 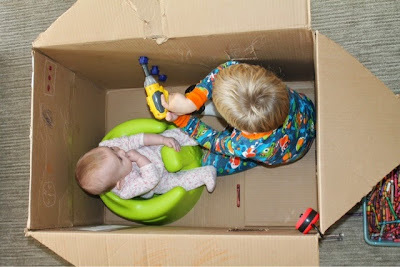 This is the perfect time of year to find boxes the size of rocket ships, trains or secret fortresses. Don't forget to save those large boxes from presents or appliances to bring out on a rainy day - they take up a little space if you break them down, but they can promise hours of creativity and imagination.